ILC NSW is very pleased to announce a new partnership with the Telstra Foundation, expanding Everyone Connects nationally, project named Everyone Connects Australia. In the pilot project, workshops were run in metro, regional and rural NSW. The overwhelmingly positive responses from participants, demonstrated the need for young people with communication disabilities have to experiment and learn. Workshop attendants were inspired to try new devices, app and options to connect to the digital world! In 2015, ILC NSW will develop more trainings and resources for public working and/or living with people with complex communication needs. We look forward to a Everyone Connects Australia! The Everyone Connects Pilot Project finished in July, with a very successful workshop at Bathurst. We’ve had an overwhelmingly positive response from participants. Many people were inspired to build their communication skills, try new apps, accessories and options to access devices, to use telecommunications to connect to the digital world! We have created a number of Educational Modules, Assistive Technology Demonstrations and Information sheets, so everyone can connect! We are delighted at the outcomes and would like to thank the Telstra Foundation – working in partnership on this project has enabled so many people with complex communication needs to connect. The first of many "Everyone Connects" Workshops kicked off on 6-Feb. ILCNSW is running these with support from the Telstra Foundation- helping people with complex communication needs to connect. We had a really interested group on the first day. 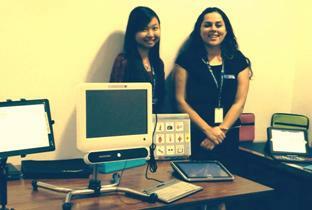 Rebecca and Yi Hueih showed to attendants some of the specialised AT we had, including eye gaze technology. At the workshop we had lots of interest in mobile technologies and apps for communications and telecommunications. ** Rebecca and Yi Hueih were still smiling when finished. Polio Australia facilitated a 4 day/3 night Polio Health and Wellness Retreat in May for polio survivors and their partners. It was held from Thursday 8 May to Sunday 11 May 2014. 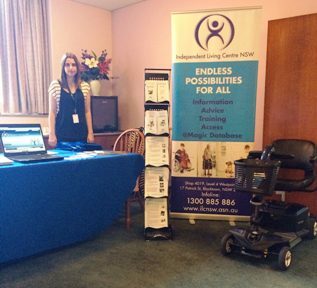 ILC NSW was present at the Health Retreat on 9 May. 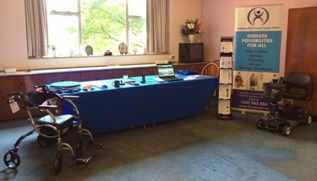 Occupational Therapist Christie Moore from ILC Client Services Team set up an information area to discuss all the possibilities with Assistive Technology. On 18-February, the Hon John Ajaka NSW Minister for Disability Services and Minister for Ageing visited the ILC Blacktown office to find out more about our work, tour our display and launch the virtual tour of our smart apartment.